Weather for the coming week looks pretty good. Temperatures in the 80s through next weekend. We do have slight chances for showers sprinkled through the coming week. Best chance looks like Tuesday. Generation off the past two days during the morning hours. One unit on at 1:00 or 2:00 p.m. then ramping up to two then three units. Projection for tomorrow is more of the same. Sunday was another floatilla day. A group from Texas decided to get one more thing off their “bucket list”….fly fishing. Carolyn drew the “wild bunch”, Denise and Bev. What a hoot. 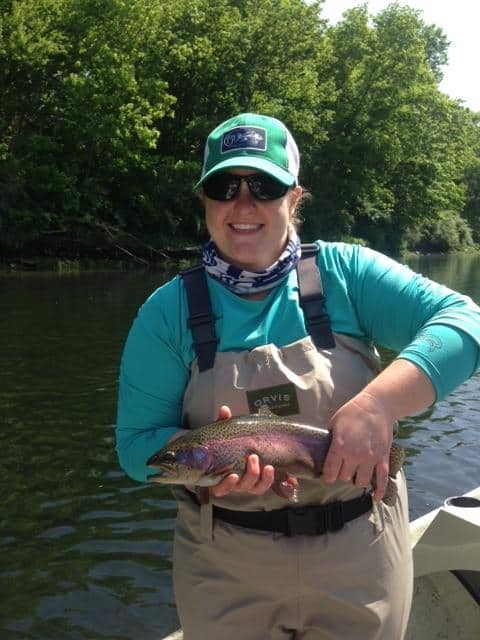 Anyone within a mile probably heard Denise catch her first rainbow on a fly rod. So much for the quiet sport! 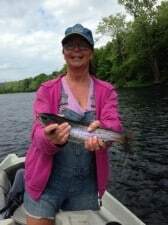 Another break in the quiet sport when Bev caught her first fish on a fly rod. The ladies best fly was a size 16 black midge dropped under the big ruby. Jim had Bev’s husband Rick. They had a good day on the CQ streamer, ruby midge and the hot hare’s ear. Vicki and Ron were with Dana. It was the red midge and a size 14 P&P midge for them. Last, but not least, Heidi and Mark were with Darrell. 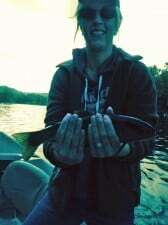 Heidi was certainly excited with her first fish on a fly rod too. They were using the black copperhead midge under the red midge. What a day!! Todd from Kansas City spent the day with Stan. No best pattern for them, but theycaught a few fish on almost every pattern he tried, and he kept changing. Tuesday, Stan had Bruce from Louisiana out for the day. Good day for Bruce on the black copperhead midge and stripping the holographic green crackleback. Connie and David fished with Carolyn a couple weeks ago and brought their daughter, Jennifer for her turn on Tuesday. So Carolyn took Connie and Jennifer out for half a day. Good job Jennifer. 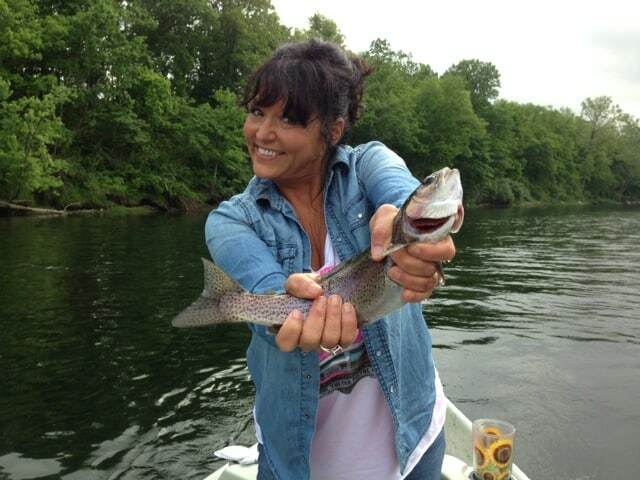 Did not take her long to to hook up with a nice 17″ rainbow. 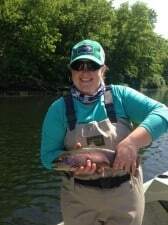 Before the day was over, all three, Connie, David and Jennifer were pulling in fish on the holographic green crackleback. Good day and great family. This entry was posted on Thursday, May 22nd, 2014 at 6:26 pm	and is filed under Fishing Reports. You can follow any responses to this entry through the RSS 2.0 feed. You can leave a response, or trackback from your own site.